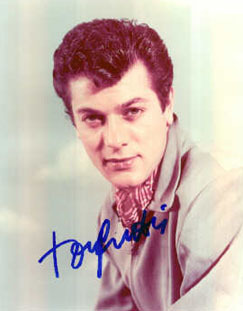 After serving in the U.S. Navy during World War II, Tony Curtis took advantage of the GI Bill to study drama. He earned good reviews in an off-Broadway production of Golden Boy, and was almost immediately offered a contract with Universal Studios. His first film was the 1949 noir classic Criss Cross with Burt Lancaster and Yvonne De Carlo, and his first leading role was The Prince Who Was a Thief with Piper Laurie. Classic films include Sweet Smell of Success with Lancaster again, The Defiant Ones with Sidney Poitier, Billy Wilder's Some Like It Hot with Jack Lemmon and Marilyn Monroe, and Spartacus with Kirk Douglas. Curtis played Albert DeSalvo in The Boston Strangler and Harry Houdini in Houdini with Janet Leigh (his first wife). On TV, he starred in The Persuaders with Roger Moore, and Vega$ with Robert Urich. In 1970, he was arrested at Heathrow Airport with a small amount of marijuana, and in later years he snorted cocaine with his daughter, Jamie Lee Curtis. In subsequent decades he said he was clean and sober, and there were no further arrests. In 1981, Curtis was paid a $50,000 advance by Doubleday Books to write a novel, but when he turned in the manuscript in 1984 they declared it unreadable and sued to recover the advance. Curtis argued that Doubleday had provided next to no editorial assistance -- just one comment from any of the company's editors over four years, and the comment had been favorable. Curtis won, but Doubleday appealed and won back the advance in a higher court. Catherine Shoard, "Tony Curtis: Marilyn Monroe Carried My Baby", The Guardian, 7 August 2009: "In 2002, Curtis told gay magazine Attitude that when he first arrived in Hollywood in 1948: I had more action than Mount Vesuvius; men, women, animals!" NNDB has been unable to verify the underlying quote, which purportedly reads in its entirety: "I was 22 when I arrived in Hollywood in 1948. I had more action than Mount Vesuvius: men, women, animals! I loved it too. I participated where I wanted to and didn't where I didn't. I've always been open about it." The Rat Race (10-Jul-1960) · Pete Hammond, Jr.